Description: Sequence shot 1 of 2 EB. Description: Sequence shot 2 of 2 EB. Description: Conrail SD40-2 6373 at about 47th Street and Damen Avenue in Chicago, Illinois on March 7, 1987, Kodachrome by Chuck Zeiler. Description: TOSE rolls 122 cars under the bridge at state line, and will pass into New York in a half mile. Description: ENPI-W approaches CP Cannon as the track equipment scurries westward. Description: ENPI-W, of course, has a differant locomotive on the headend, and I try to "sueeze" in a decent shot among the "yellow horde" exiting the siding. Description: Going away of ENPI-W. Description: CR 6373 and sister drifting back towards Altoona to helper another heavy westbound. 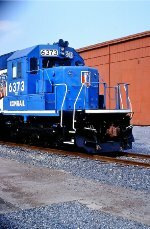 Description: CR 6373 supplies braking power to the rear end of an intermodal during my first visit to the curve in early August, 1995.